view another article... This foot condition is the new back pain — it’s everywhereCarestream, CurveBeam to spread word about weight-bearing CTNew Cartiva ImplantPain Free Plantar FasciitisUFAI featured on ABC NewsCarolina Panthers Star Lotulelei's Foot InjuryFoot Surgery InnovationsBiggest Opportunities for Foot SurgeonsDoctors TV Show - Foot Surgery while PregnantPlantar Fasciitis TreatmentsThe Doctors TV, Living with Plantar FaciatiisHow to Stop Foot Pain for Good44 Ways to Correct Hallux ValgusDo fat-soled running shoes protect aging joints?Ankle replacement can restore mobilityCam Newton's Ankle InjuryMinimally invasive Foot & Ankle Surgery49ers' Crabtree 'amazing' Achilles recoveryAbout Kobe Bryant's Knee InjuryCurry more likely to play than Bryant3-D Scan Reveals Foot Damage by High HeelsAlbert Pujols' Foot InjuryWill Kobe Return? Doctors Raise Questions About Laker Star's Future In The NBAWhat Kobe must do to prove 'doubters' wrongKobe Bryant's difficult task ahead after injuryPau Gasol's return from foot injuryIs barefoot running a bad fad, or better choice?Born to Run Barefoot?Born to run barefoot? Some end up getting injuredCan a $15 basketball shoe have game? Let's give our feet a little more credit. Here's how they can alert you to serious issues like diabetes, thyroid disease, and heart disease before you can even get to the doctor's office. Especially if moisturizer doesn't help. When the thyroid gland (the butterfly-shaped gland in the base of your neck) goes on the fritz, it doesn't properly produce thyroid hormones, which control metabolic rate, blood pressure, tissue growth, and skeletal and nervous system development. “Thyroid problems cause severe dryness of the skin,” says Marlene Reid, DPM, a foot specialist in Naperville, Illinois. “When we see cracking on the feet, or if moisturizer doesn't improve dryness over a few days, we usually refer patients to their primary doctor to make sure their thyroids are OK.” Brittle toenails can also signal thyroid complications. If the fuzz on your toes suddenly disappears, it could signal poor blood circulation caused by peripheral arterial disease (PAD). “Signs of PAD can include decreased hair growth on the feet and ankles, purplish toes, and thin or shiny skin,” says Suzanne Fuchs, DPM, a podiatric surgeon at North Shore University Hospital in New York. A build up of plaque in the leg arteries, PAD affects about 8 million Americans. 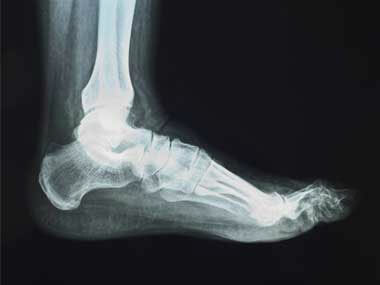 Symptoms are subtle, but doctors can check for a healthy pulse in the foot or spot PAD on an X-ray. If we take an X-ray of a broken foot, and I see a hardening of the arteries, 99 percent of the time, the same thing is happening in the heart blood vessels. You notice Ulcers that don't heal. It could be Diabetes. Uncontrolled glucose levels can damage nerves and cause poor circulation, so blood doesn't reach the feet. When blood doesn't get to a wound caused by, say, irritating shoes, the skin doesn't heal properly. “Many, many people with diabetes are diagnosed first because of foot problems,” says Reid. 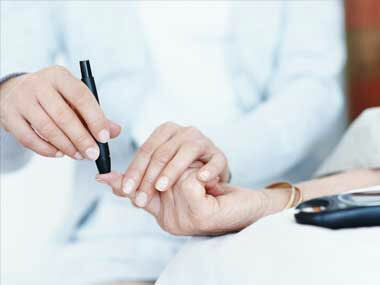 Other signs of diabetes may include tingling or numbness of the feet. Ask your doctor about getting your blood sugar levels tested. You notice: Enlarged, painful big toe. It could be what you ate (really)! Gorged on wine and steak? The painful aftermath could be gout, a type of arthritis that usually affects the joint of the big toe. Foods high in purine, a chemical compound found in red meats, fish, and certain alcohol, can trigger an attack by raising levels of uric acid in the body. Uric acid is normally excreted through urine, but is overproduced or under-excreted in some people. “You'll see the deposition of the uric acid in the joint, most commonly the big toe or the ankle,” says Bob Baravarian, DPM, a podiatric foot and ankle specialist at Providence Saint John's Health Center in Santa Monica, California.“The patient will wake up with a hard, red, swollen joint. It's extremely painful.” A doctor may prescribe anti-inflammatory drugs for short- term relief and suggest a low-purine diet for long-term prevention. Red streaks underneath the toenails or fingernails could be broken blood vessels known as splinter hemorrhages. These occur when small blood clots damage the tiny capillaries under the nails. They can signal endocarditis, an infection of the heart's inner lining. People who have an existing heart condition, have received a pacemaker, or who have chronically suppressed immune systems (such as cancer patients receiving chemotherapy, HIV patients, and diabetes patients) are at higher risk of developing endocarditis. The infection can result in heart failure if left untreated. If you notice splinter hemorrhages on your toenails or fingernails, and haven't experienced any recent trauma to the nail, see your doctor to check your heart and blood circulation. Another symptom that appears in both toes and fingers, clubbing is often associated with lung cancer, chronic lung infection, heart disease, or intestinal disease. Lung cancer and heart disease decrease vascular resistance, which means blood flow to the small arteries in the toenails and fingertips will increase. Tissue swells and results in the “clubbed” appearance (rounder, wider fingers and toes). Though patients are typically aware they have a disease that is causing the clubbing, it's best to get checked if you see any abnormalities. Five percent of people with nail psoriasis aren't affected elsewhere. “If you've never been diagnosed with psoriasis, but your toenails have little pits in them, you should get them checked out,” says Pichney. 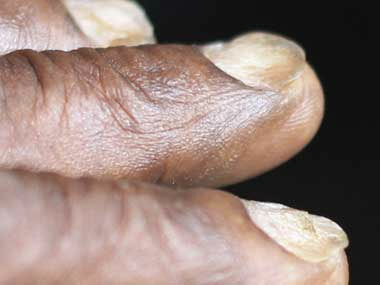 Other symptoms include white patches and horizontal lines across the nails. To treat psoriasis, your doctor may prescribe topical creams or steroids to be injected under the nail. Do you have a depression in the toenail deep enough to hold a water droplet (also known as koilonychias)? Spoon-shaped toenails or fingernails can indicate iron deficiency, as well as hemochromatosis (overproduction of iron), Raynaud's disease (which affects blood supply to the fingers and toes), and sometimes lupus (an autoimmune disease in which the body's immune system attacks cells, tissues, and organs). 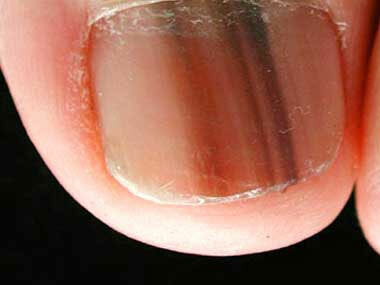 Spooned nails occasionally appear in infants, but normalize in the first few years of life. If you notice spooning, contact your physician, who will administer a blood test to identify the exact cause. A dark, vertical line underneath a toenail could be acral lentiginous melanoma, or hidden melanoma, a form of the skin cancer that appears on obscure body parts. (Other hidden melanomas include eye melanoma and mouth melanoma.) It will be a black line from the base of your nail to the end of the nail and should be seen by a podiatrist or dermatologist at once. You want to make sure it's not fungus, which is usually yellow brown and sporadic throughout the whole nail.” Although only 5 percent of all diagnosed melanoma cases are the hidden kind, hidden melanoma is the most common type in dark-skinned people. 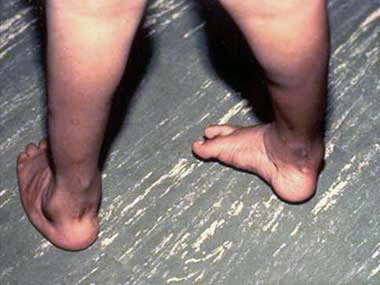 An inherited disorder that damages the peripheral nerves (those outside the brain and spinal cords), CMT can also cause changes in gait, numbness in the feet, difficulty balancing, loss of muscles in the lower legs, and later on, similar symptoms in the arms and hands. See your doctor if you notice abnormalities. “For anything that's different or changes when it comes to the foot, see your doctor as soon as possible!